Orange flowers are not as common in nature as white, yellow, red or purple ones. When you come across some brilliant orange blossoms, you definitely take notice. 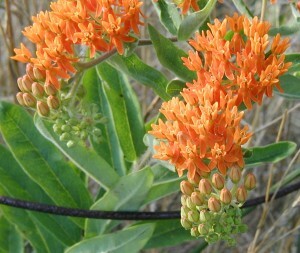 Brilliant flowers of the Butterfly Weed are easily seen in summertime fields of weeds. 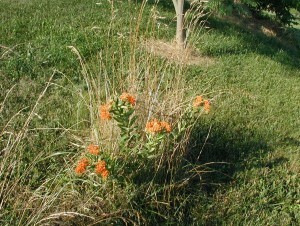 Even if the grass gets as tall as this native plant the flowers can be seen from a distance because of their bright orange color. 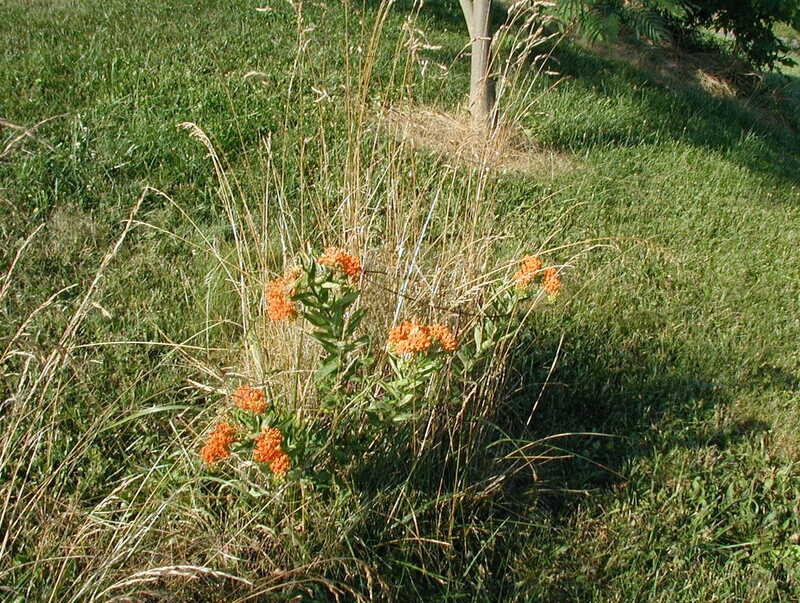 Butterfly Weed in the lawn is protected from the mower with a wire cage. Photo taken 13 July 2011. The Butterfly Weed, Asclepias tuberosa, is related to the common milkweed. You can see similarities in the leaves and flowers of these two members of the Milkweed family, Asclepiadaceae. Oblong leaves alternate up the stiff mainstem of the foot and a half tall plant. 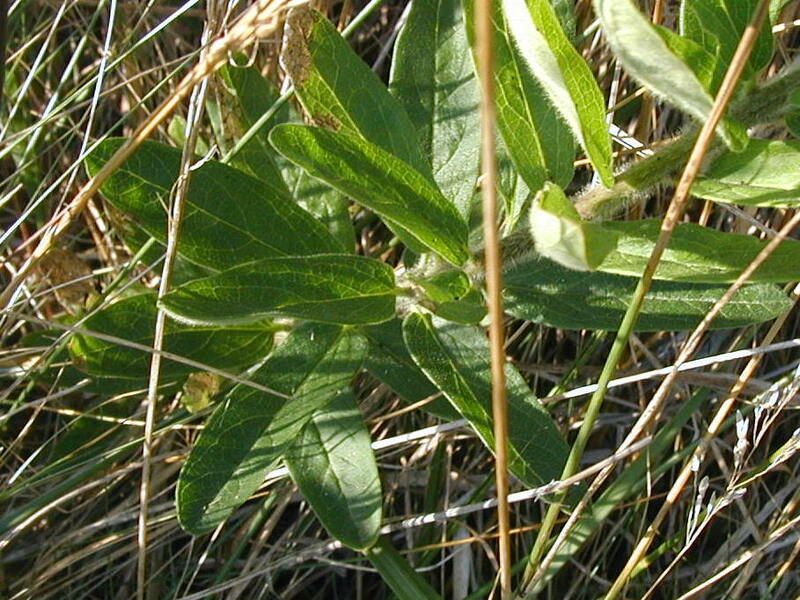 Most milkweeds have opposite leaves or leaves in whorls. Stems are hairy. When broken the stems release a clear juice, not milky like other milkweeds. Oval hairy leaves of butterfly-weed alternate up its hairy stem. Photo taken 13 July 2011. The flower structure is unique to milkweeds. Milkweed flowers occur in loose umbels at the top of the plant. Five downward-pointing petals flare out below a five-pointed crown. The crown has five tips that connect to the united internal flower parts made up of stamens and stigma. Seeds are held in elongated pods about 4-5 inches in length. Individual seeds are connected to feathery fluff that helps the seeds spread with the wind. If you’re lucky enough to find this beautiful perennial plant, take home a few seed pods instead of digging up the whole plant. It has a long tap root, so it would be difficult to get the whole root for transplanting it successfully. Butterfly-weed is a nice addition to any sunny flower garden, and as its name suggests it will draw butterflies to the area. An alternate name for butterfly-weed is Pleurisy Root because Native Americans chewed the root for lung inflammations and bronchitis. Although the root has laxative, diuretic and expectorant qualities, it may be toxic in large doses, so it is not recommended to consume this pretty weed. We made some elderberry jelly this year and this time we used a slightly different recipe. We’ll have a taste-test or two on the upcoming weekends, so we’ll comment back when the consensus is in. From the initial sampling, we can say that both recipes are delicious. The elderberries ripen around the middle of August here in central Pennsylvania. Clusters were cut from four plants with scissors and dropped into a 5 gallon bucket. Other folks have commented that the hot weather hit some of the berries really hard this summer or that the birds beat them to the elderberries. We are lucky to know of a spot where the elders grow next to a small stream. Evidently, they weren’t bothered by the extremely hot summer weather. The elderberries were twisted off their clusters into large bowl. A cup at a time was measured into metal bowl with a flat bottom and then crushed with a potato masher. 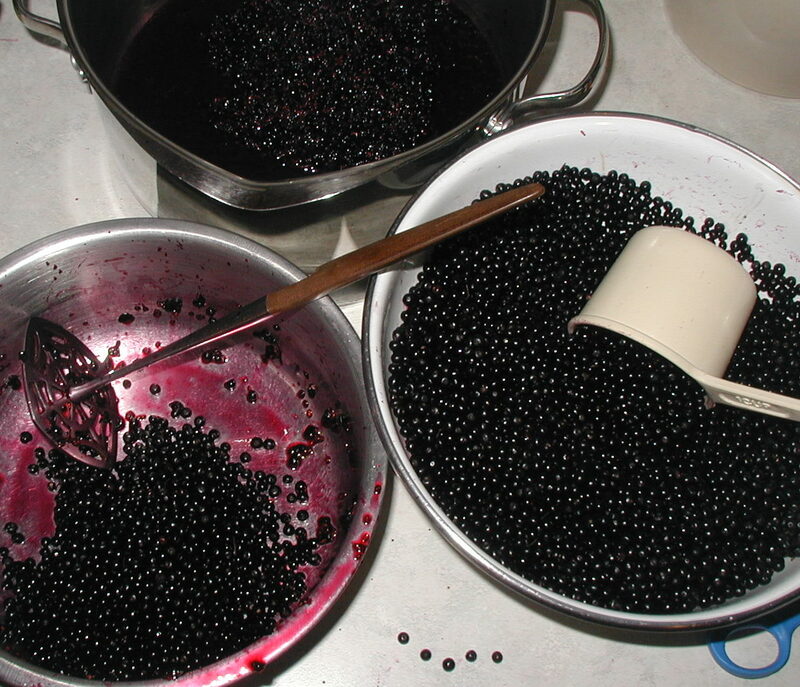 To keep track of how many cups were processed so far, a single berry was placed on the counter in one spot each time a cup of berries was transferred to the mashing pot. The large bowl on the right contains wild elderberries that were transferred to the bowl on the left for mashing, one cup at a time. The mash and elderberry juice were poured into the cooking pot at the top of the photo, taken 16 Aug 2011. Loose berries on the counter, at the bottom of the photo, indicate that 5 cups of berries were processed so far. It was more of a curiosity to know how many cups of elderberries were processed. If we were a little shy of the quantity of juice needed for the recipe, we could make up the difference with whatever fruit juice was in the refrigerator at the time. It’s worked just fine in the past by using up to 1/2 cup apple-raspberry juice to get the total juice volume with no effect on taste, as far as we could tell. We had 12 cups of elderberries. The mashed berries were poured into large cooking pot. The heat was turned on to bring it to a boil and then simmered for 10 minutes, covered. The warm mash was taken off the heat and spooned onto dampened cheesecloth, three layers thick that had been laid cross-wise across the bottom of a large bowl. The ends of the cheesecloth were pulled up to retain the seeds and pulp and to allow juice to drip out into the large bowl. The ends were tied together and hung from the cupboard with a clothes hanger, rubber-band and clip. The juice was allowed to drip from the cheesecloth for a couple of hours, although most of the dripping was done in the first hour. The elderberry seeds and pulp that were retained by the cheesecloth were spread in an area where it would be nice to have elders grow. Elderberry juice was measured into a large cooking pot, 3 1/2 cups, and 1/4 cup lemon juice was added. The package of pectin was gradually stirred in and the mixture heated to a rapid boil. The measured sugar was added and brought back to a rapid boil for one minute. The jelly was taken off the heat and ladled into hot jelly jars using a funnel. We made six 8 oz. jelly jars full. A couple of things were different this time compared to other years when we’ve made elderberry jelly. 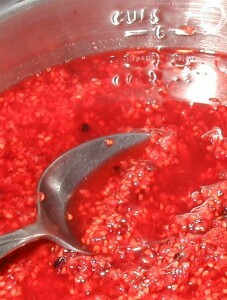 We hadn’t heated the mashed berries before straining out the seeds when making this jelly before. This extra step probably isn’t necessary, but we wanted to try it out. When the elderberry juice and pectin are cooked, and when the sugar is added and the mixture is continuing to cook, that is probably enough cooking to bring out the elderberry flavor. The old elderberry jelly recipe used 3 3/4 c. unheated juice, a box of pectin, and 4 1/2 c sugar. Without pre-cooking the mash, 8 cups of berries made 3 cups of juice. For the last 1/2 to 3/4 cup the cheesecloth bag was pressed to expel the last bit of juice. The new recipe used 3 1/2 c simmered juice, 1/4 c. lemon juice, a box of pectin, and 4 1/2 c sugar. So, simmering the mash before straining the seeds and adding lemon juice were the changes from the old recipe. Our 12 cups of berries made 3 3/4 cup juice and no pressing of the cheesecloth was necessary. We’ll have to have a taste-test with the elderberry jelly we’ve made before. Good thing we made two batches last year – there’s still a few jars in the pantry. Will the lemon juice make a difference? The acid of the lemon juice is supposed to help the gelling process. Each time we’ve made it, we’ve used a package of commercial pectin and had no problems with the jelly setting. Indeed, the elderberry jelly we’ve made has always turned out a little stiff compared to other jellies. What effect will simmering the berry mash before the juice collection have? With the old recipe we mashed the elderberries and right away hung up the mash to collect the juice. The juice from this batch of jelly was cooked a lot more and may be stronger tasting because some water evaporated when the mash was still warm from simmering. So far, we’re not sure if the new recipe or the old recipe will win the contest, but we’re looking forward to your input. Does everyone use lemon juice and pre-cook the elderberry mash? Making jams and jellies is a summertime activity for us here in Pennsylvania. 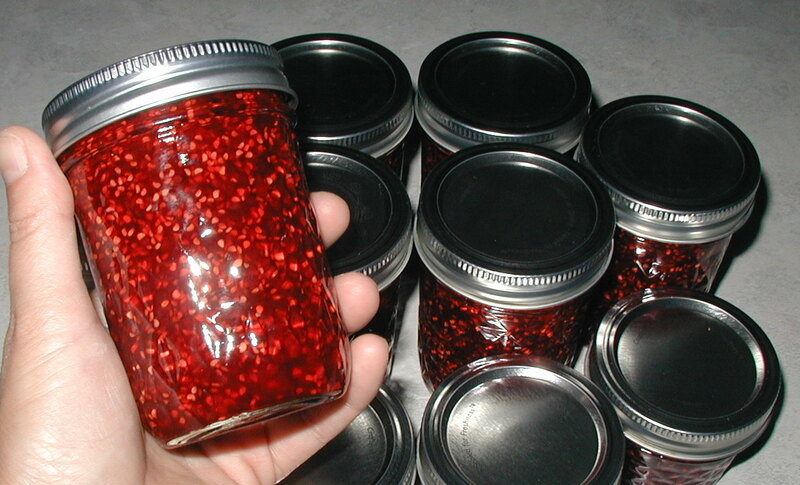 Actually, we’ll start in spring with our canning activities by making strawberry freezer jam or blueberry jam. By the time summer rolls around the raspberries ripen up for their turn under the potato masher. This year we made a new jam for the first time, Wine Raspberry Jam. Wineberries are a delicious and slightly sour kind of red raspberry. They originated from Asia, but are now established in the eastern United States. They are also known as wine raspberries. Since we ate berries all day and still came home with almost four quarts on the day we picked them in early July, we decided to make some jam. Like most berries these are probably the best when eaten fresh, but their fruiting season doesn’t last too long. Making jam is the best way to enjoy them all year long. To make homemade jam, it’s pretty easy. This recipe should work for any berry. Consult the information sheet that comes with a box of pectin for ratios of fruit to sugar for the different fruits. Some are more watery than others, so adjustments to a generic recipe might be warranted. What follows worked great for our wine raspberries. Washed wineberries ready to be smashed for jam. Photo taken 11 July 2011. Wash a dozen jelly jars. We used the dishwasher on a light cycle just before making the jam. That way, the jars were hot just prior to filling with the cooked jam. Take out one jar at a time and let the others remain hot in the washer. Heated jars will seal better than cold ones. Put lids and bands together and place in bottom of large pot. Cover with boiling water to sterilize the lids. Measure out 7 cups of sugar into a large bowl. Use a potato masher to smash about a cup of berries at one time. Measure out five cups of crushed wineberries into a large (6 qt.) saucepan. Five cups of crushed wineberries for making jam. The berries seemed very watery and quite seedy. Photo taken 11 July 2011. Gradually stir in one box of fruit pectin, any brand. Heat over high heat – stirring constantly – to a full, rolling boil. Add the sugar all at once. That’s why you measure it out in advance. Heat the fruit and sugar mixture, while stirring, to a full boil. Boil for one minute. Remove from heat. Use a ladle and funnel to fill one jar at a time. Leave a quarter-inch of headspace. Wipe any drips from the rim or threads of the jar with a damp paper towel. This step might not be necessary when you can use a funnel to fill the jars. Rest the funnel in a glass in between filling jars. Use tongs to remove a lid and band from the large pot and shake off excess water. Screw top firmly on jar and invert jar onto its lid. Ladle jam into the remaining jars and add lids. Fill one jar at a time. Makes eight or nine 8 oz. jars. Turn all jars upright and leave undisturbed for 24 hours. For quality assurance purposes eat some toast with jam from the cooking pot. Listen for the ‘pop’ of the lids as the jam cools and the jars seal. Test the seal by pressing down on the lid with a finger. If the lid moves, it didn’t seal. Refrigerate any jars that did not seal. 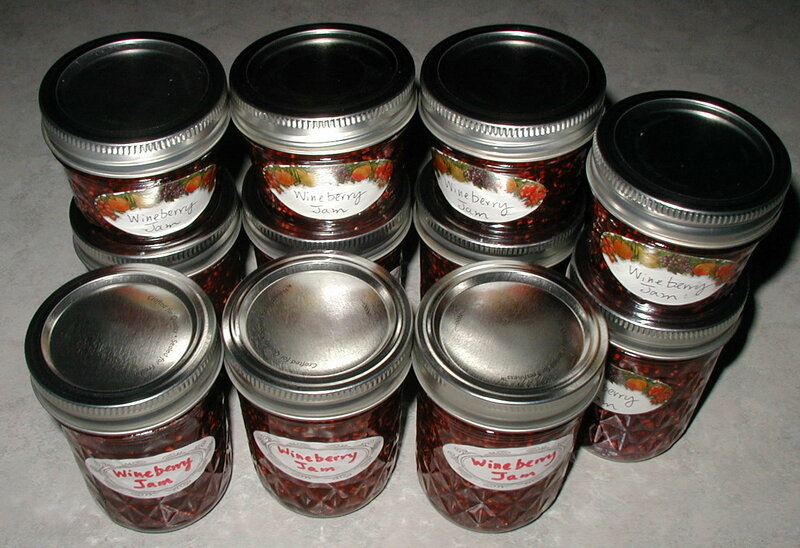 Label the jars with “Wineberry Jam”. Wineberry jam looks rather seedy, but the seeds are not tough ones for the most part. Photo taken 11 July 2011. Eleven wineberry jam jars labeled for the pantry. Photo taken 11 July 2011. Wine raspberry jam is a new addition to our pantry. These jars will sit next to the blueberry jam, blackberry jelly and elderberry jelly until handed out as gifts or enjoyed on bread or toast. We went over to a friend’s farm to pick red raspberries. The day was predicted to be a scorcher, so we arrived in mid-morning. By then the heat was on and the dew was off the brambles. Even though we knew we’d be sweating we wore boots, jeans and hats for protection from thorns and poison ivy. Without clompers a lot of berries would only be bird or bear food as the canes really do form “impenetrable thickets”. It turns out the kind of berries we were picking are called Wine Raspberries or Wineberries, Rubus phoenicolasius, an alien species originally from Asia. It was introduced in America for use in breeding raspberries and subsequently escaped cultivation. 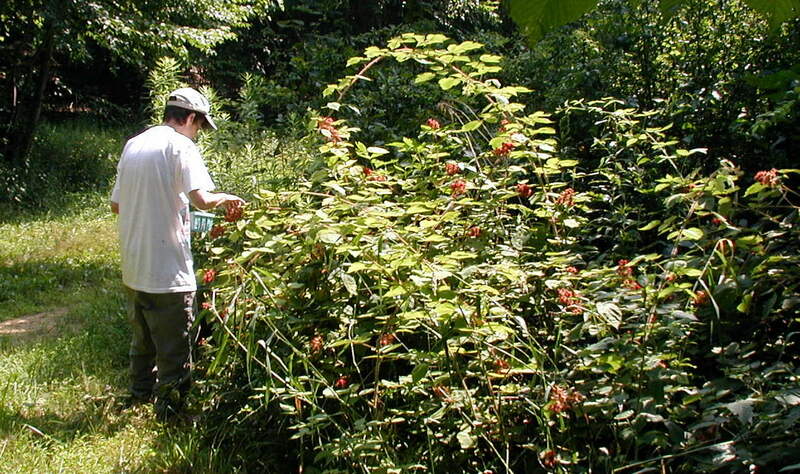 Wineberry has adapted so well here that it’s considered an invasive weed in Connecticut and Massachusetts. Picking wineberries along a farm road in Juniata County, Pennsylvania. Photo taken 11 July 2011. The hillsides in Pennsylvania where we were picking berries also had blackberries and blackcap raspberries, but there were more canes of the wineberries. The blackcaps were just finishing their fruiting and a single big berry was ripe enough to pick from each blackberry cluster. 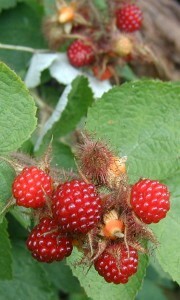 The wineberry clusters were moving into the middle of their fruiting season. Canes in less sunny spots help to spread out the harvest as their berries ripen a little later. Most clusters had that first berry already picked off and the ones getting the most sun were ready to fall off the vine, so to speak. We held our containers underneath a cluster with one hand while gently encouraging the bright red berries to drop into it with the other. Iridescent red wineberries on the vine. Photo taken 11 July 2011. Wineberry plants are a little different from the cultivated red raspberry. The most noticeable difference is the great amount of purple-red hairs and thorns on the wineberry canes and fruit clusters. It’s not surprising to see these projections on the canes, but it was unexpected to see such bristly capsules from which the fruit appears. Fruits are enclosed by a calyx that is covered in fine reddish hairs that exude a sticky liquid. When the berry is nearing ripeness, the calyx opens to reveal a pale yellow fruit that changes color to bright red, and when fully ripe and most flavorful, to a burgundy or wine color. When a berry is plucked from the cluster an orange cone is left behind. The cone left behind a blackcap raspberry is cream-colored. A wineberry cluster showing orange cones left behind where berries were picked. Unripened berries are each still covered by a hairy, red calyx. Photo taken 11 July 2011. Leaves are in threes with one being larger than the other two. 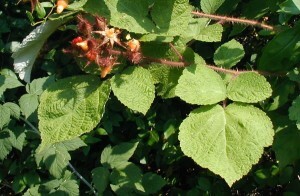 They are fatter leaves, or broader than, the leaves of a blackcap raspberry or blackberry shrub. The underside of the leaves appears white. 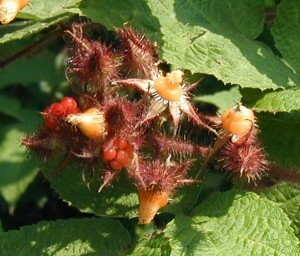 Fruit cluster at the tip of a wineberry cane. Note the red, hairy, thorny canes and three leaflets with one being larger than the other two. Photo taken 11 July 2011. Although wineberry is an introduced plant, it’s here to stay so why not benefit from it? We sure did as we picked as many as we could reach and ate a lot of them along the way. Instead of bringing home a cane or two to plant on our ridge top, we’ll leave them where they are and go back to pick more next year. A delicate looking plant that blooms in the woodlands during the first half of July is called Cow Wheat, Melampyrum lineare. It’s a member of the Figwort or Snapdragon family, Scrophulariaceae. Singular stem branches into several stems with opposite leaves. Photo taken 4 July 2011. 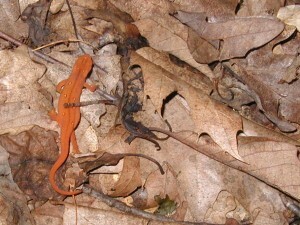 The opposite leaves are lance-shaped, entire, smooth and 2 to 3 inches long near the base of the plant. Leaves near the stem tips are shorter and have long, pointed projections at their bases. Upper leaves near the white and yellow flowers have pointed projections at their bases. Photo taken 4 July 2011. 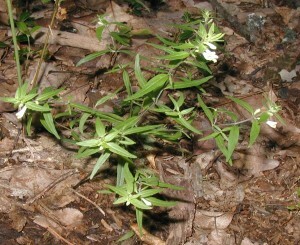 Flowers rise on short stalks in the leaf axils near the stem tips. 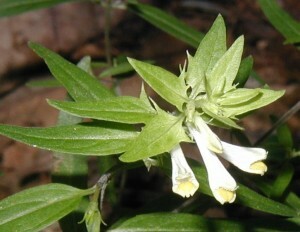 Tubular, two lipped flowers are white and yellow. The upper lip is two-parted and white. 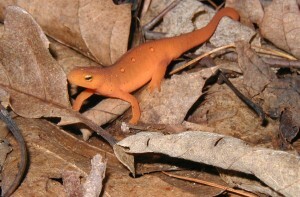 The lower lip is three-parted and yellow. The lips are joined into a tubular flower that appear to be white on the outside and yellow on the inside, or tipped with yellow. The whole flower is about half an inch long. Apparently, there are no edible nor medicinal qualities to cow-wheat. The Peterson Guide to Wildflowers describes it as a “smooth, parasitic plant”, but did not indicate what it parasitizes. The roots of trees, I suppose. 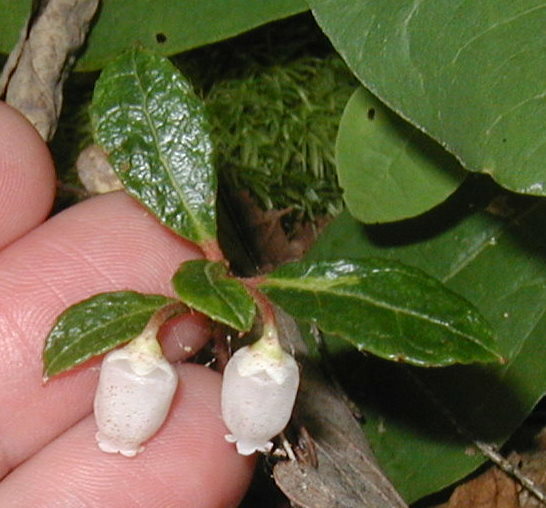 In Pennsylvania you’ll probably only see this plant in the mountains as it is native from Canada south to northern Wisconsin, northern Minnesota, northern New England and eastern Maine. The several cow-wheat plants observed here were growing on a mountain ridge in south-central PA.
One of the flowers that I look for each summer in our woodlands is called Spotted Wintergreen. It’s a low-growing, native perennial with evergreen leaves. 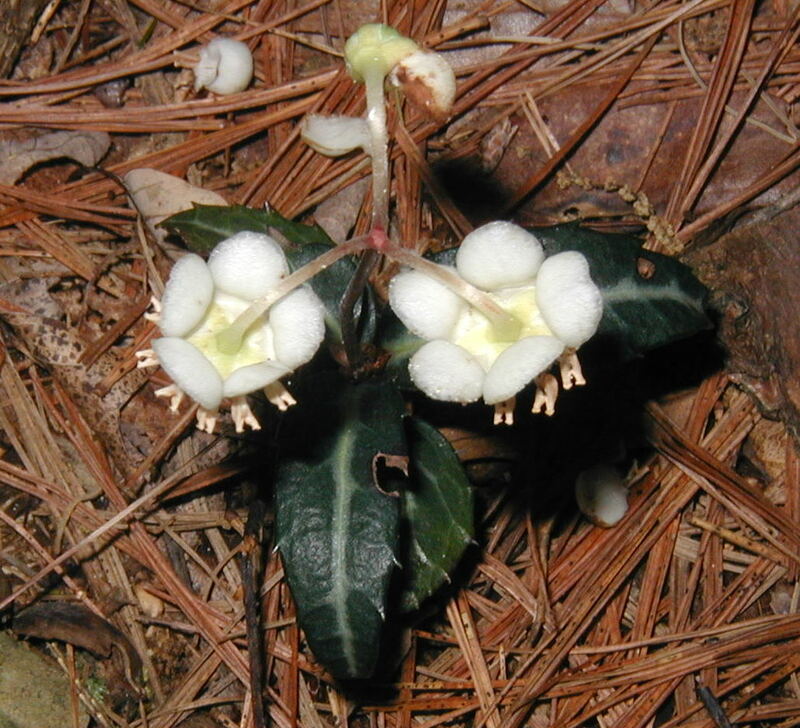 Spotted wintergreen blooming from established foliage. Photo taken 26 June 2011. 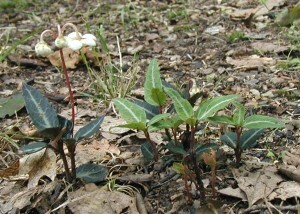 Spotted wintergreen, Chimaphila maculata, has thick, tapering evergreen leaves. 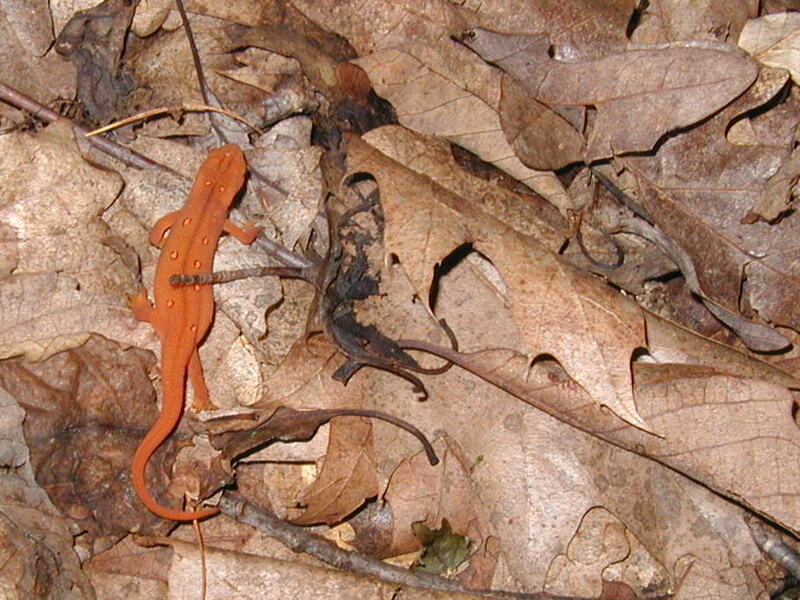 Its leaves can be found all year long, sometimes hidden by the leaf litter. 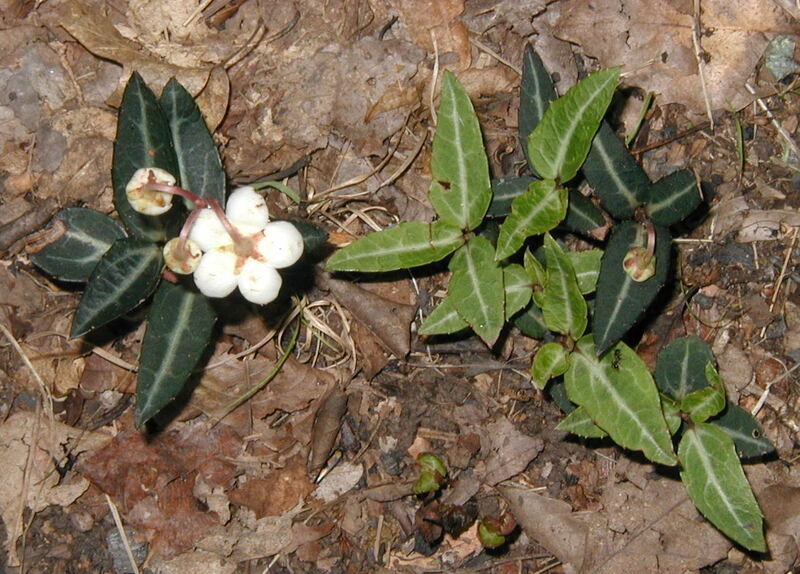 A pale streak runs down the middle of each leaf, which tells of its alternate name, Striped Wintergreen. New growth is light green, while that which has overwintered is a dark green. 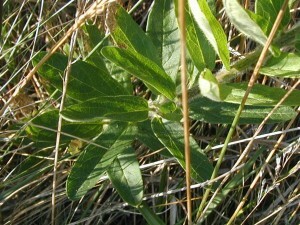 Two or three basal leaves underlie a whorl of three pointed leaves. A reddish-purple flower stem rises from the center of the whorl of leaves and ends with one to three upside-down flowers. The nodding flowers might look like miniature street lamps, where the stem rises up and curls over to support each downward-pointing blossom. The whole plant is only 4 to 10 inches tall. 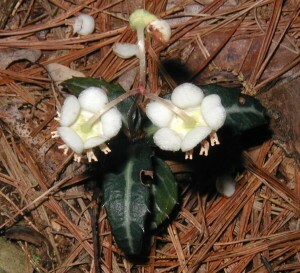 Side view of flowering spotted wintergreen. Photo taken 26 June 2011. New growth comes up from underground runners and the new foliage is a much lighter green than the older leaves. The stems are very stiff, and since the flower is so low to the ground it had to be turned sideways to see the center of the blossom. Unusual arrangement of stamens in the downward hanging flowers. Photo taken 26 June 2011. Pale midribs on leaves of spotted wintergreen. Photo taken 26 June 2011. 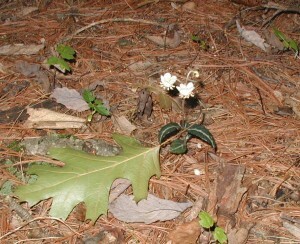 Spotted wintergreen blooming underneath a white pine tree. Photo taken 4 July 2011. Looking down on two blooms of spotted wintergreen and some fallen petals from a third blossom. Photo taken 4 July 2011. 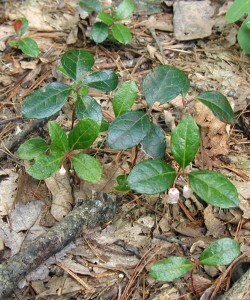 Wintergreen, Gaultheria procumbens, is also called Checkerberry or Teaberry. 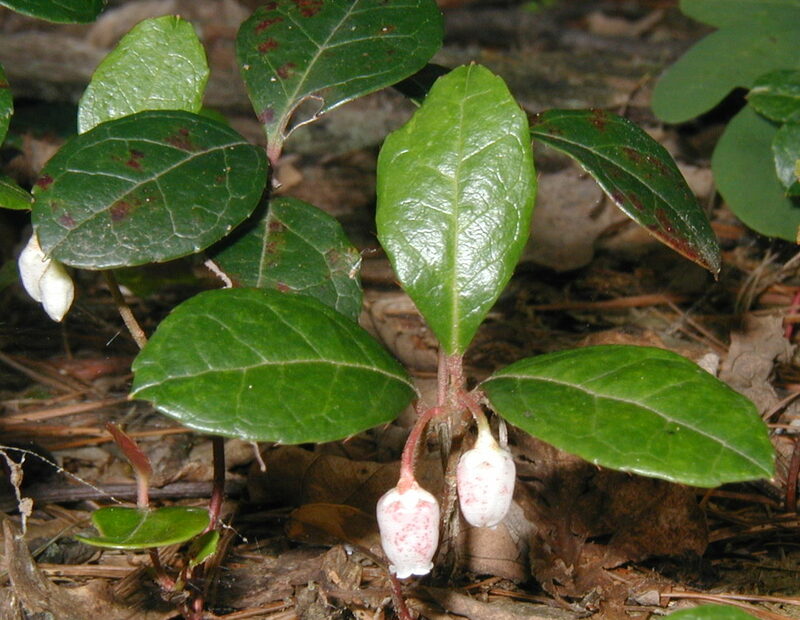 You might be familiar with Teaberry Gum or Teaberry Ice Cream – well, the flavor comes from wintergreen. It’s a low-growing plant that can be found in woodlands, especially in northern areas of the eastern US and Canada, and in the mountains toward the south. It’s a member of the Heath family, Ericaceae. 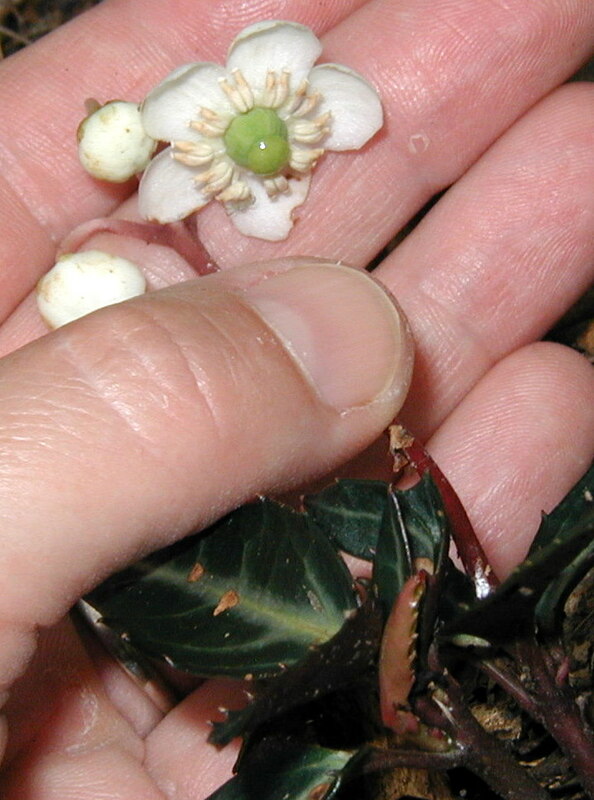 The evergreen leaves of wintergreen are thick and leathery, shiny ovals. 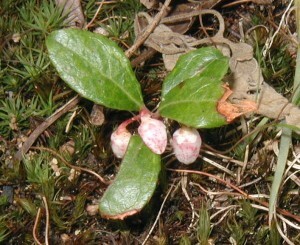 New growth appears in a light green and the older growth that has overwintered may have shades of purple. 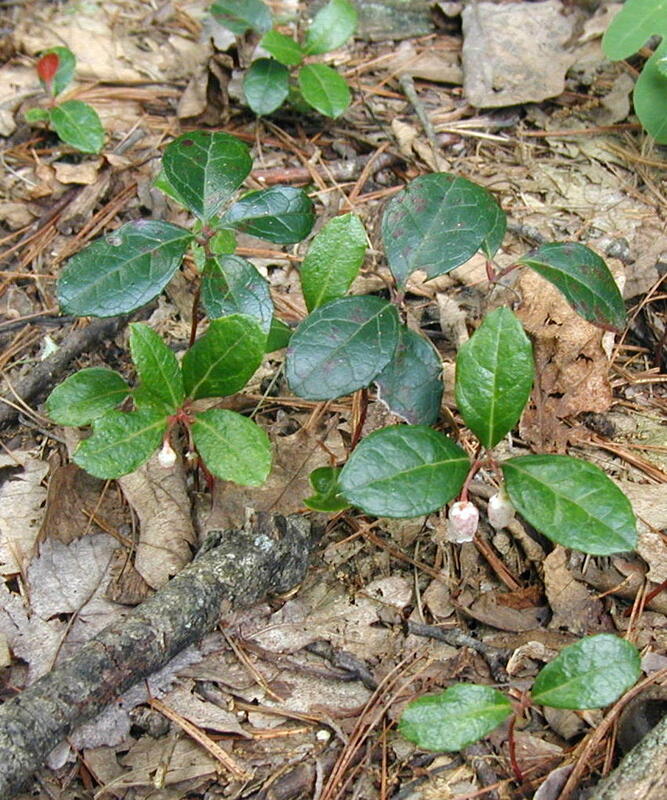 Damage to the slightly toothed leaves can be seen on many plants, but they still seem to function ok.
Wintergreen is a perennial woodland plant. The plants are found in colonies. Stems rise up from underground runners that creep along, so several “plants” found together are really several branches from a common underground stem. 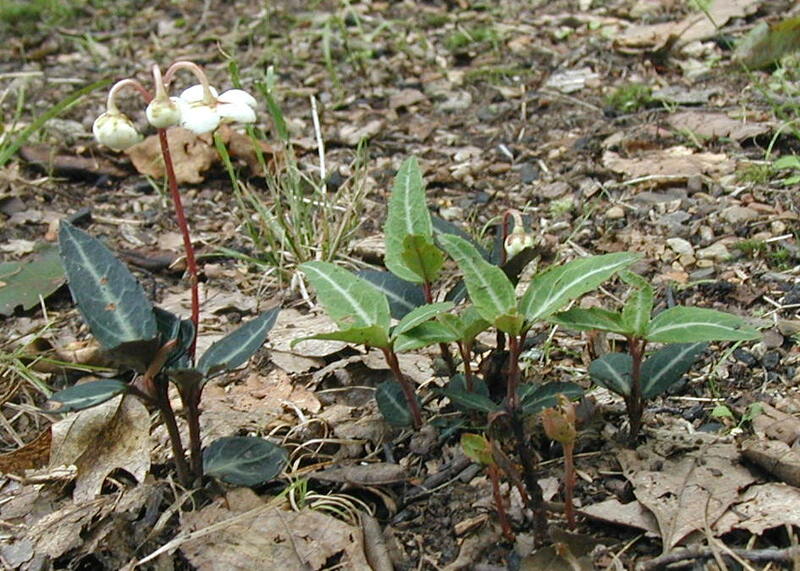 A cluster of wintergreen plants. Photo taken 26 June 2011. Wintergreen flowers are small, drooping egg shapes before they open into bells that are reminiscent of huckleberry or blueberry blossoms. Each flower hangs from a leaf axil, usually one per leaf. The blooming period is late June through July. 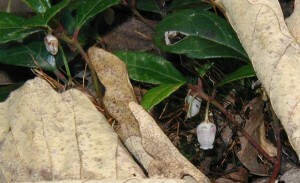 Dangling white flowers of wintergreen are spotted with pink. Photo taken 26 June 2011. 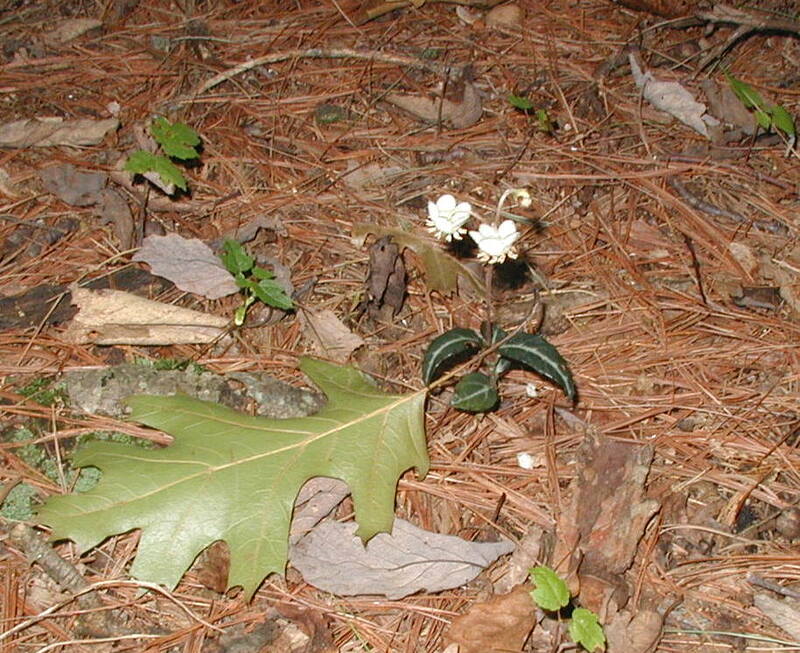 Sometimes the leaves and flowers of wintergreen are obscured by the leaf litter. Photo taken 26 June 2011. 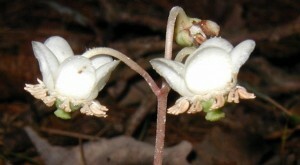 The white and pink dangling wintergreen flowers are lightly fragrant, as are the leaves and fruit. 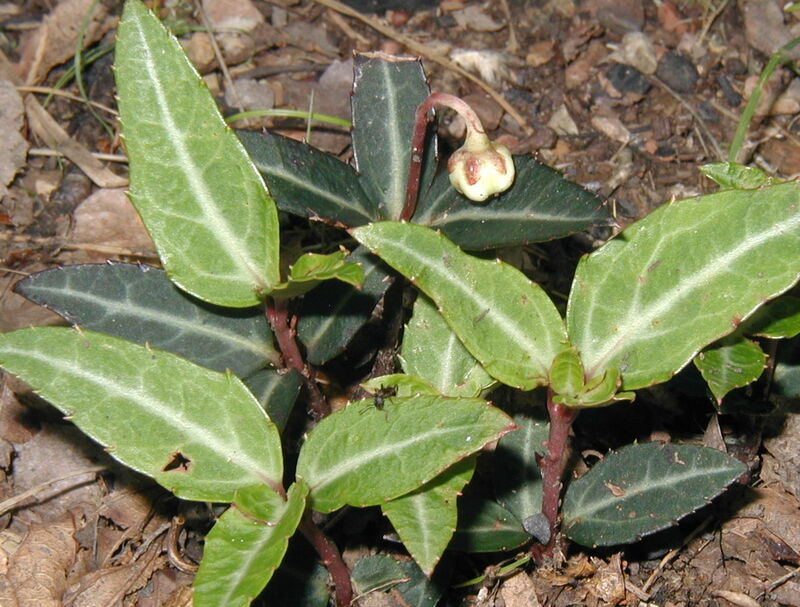 The leaves taste of wintergreen and have been used in making tea. Teaberry in bloom. Photo taken 26 June 2011. The smallest blooming wintergreen plant measures less than two inches across. Photo taken 4 July 2011. 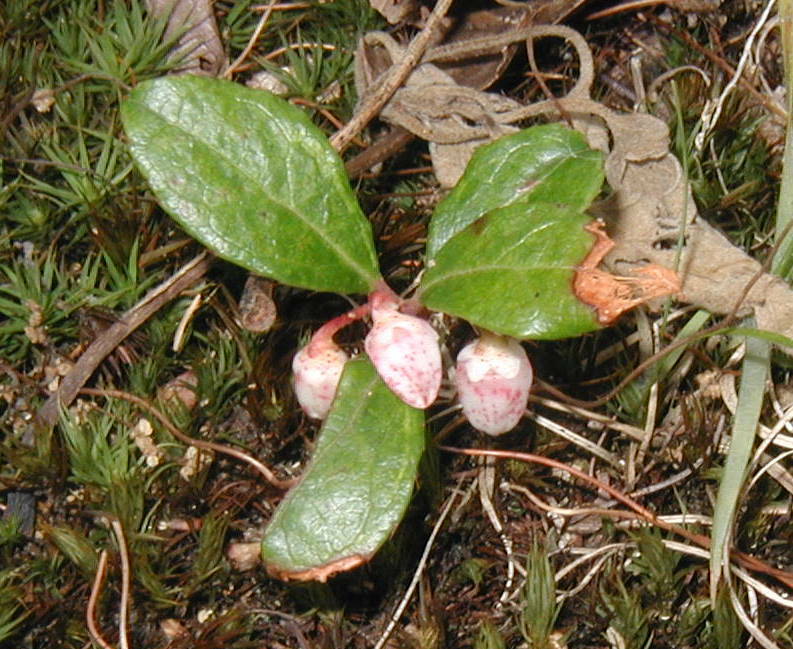 Red, round wintergreen fruits will develop in the fall, some of which will overwinter and still be seen in the springtime.